Retroperitoneal fibrosis is a rare condition in which the ureters (tubes that carry urine from the kidneys to the bladder) are obstructed by a mass located behind the stomach and intestines. Estimated to affect one out of 100,000 people, this blockage prevents normal urination and can create serious issues for the kidneys if they become damaged due to urine buildup. In the early stages, the person--usually middle-aged men--may feel a dull pain in the abdomen that advances, but eventually urinary output may be greatly minimized or nonexistent. Medications used for migraine headaches (such as beta-blockers, methysergide and ergotamines), high blood pressure (hydralazine), and Parkinson's disease (particularly when pergolide is taken with levodopa) have vasoactive substances that constrict or dilate the blood vessels. Prolonged constriction and dilation can lead to perivascular edema, cause plasma content to leak from the blood vessels through pores or tears in the cell membranes, and spark the fibroblastic response. Ascites, defined as the buildup of fluid in the space between the stomach’s organs and the stomach’s lining. This space is called the peritoneal cavity. Patients diagnosed with retroperitoneal fibrosis usually have some level of renal insufficiency. Also, half of those with retroperitoneal fibrosis have hypertension or high blood pressure. When diagnosing retroperitoneal fibrosis, a physical examination is often the first course of action, followed by an abdominal CT scan, which uses X-rays to create images of the belly. Blood urea nitrogen (BUN) test: gauges how much nitrogen is in the blood to determine how well the kidneys are functioning. Creatine test: Creatine is a waste product filtered by the kidneys and eliminated through the urine. If the kidneys aren’t working well, creatinine builds up in the blood. 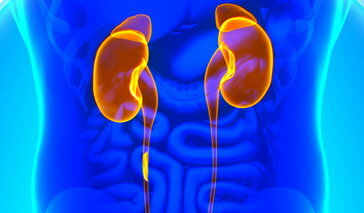 Creatinine levels are measured in the blood and urine, again assessing kidney health. Intravenous pyelogram (IVP): Contrast dye is injected into the patient's arm and X-rays are taken of the bladder, kidneys, and ureters (tubes that funnel urine from the kidneys to the bladder) to see how the dye collects in the urine and how well it is removed by the kidneys. CT scan: takes and combines a number of X-rays that have been taken from different angles and uses a computer process to produce cross-section images of the soft tissues and bones. When treating retroperitoneal fibrosis, patients with this problem generally are given anti-inflammatory medications first. If they do not work, medications that subdue the immune system are tried. In the event these fail, more invasive methods, namely stents and surgery, are used. Cannon M. (2012). Methotrexate (Rheumatrex, Trexall). American College of Rheumatology. Vaglio A, et al. (2011). Prednisone versus tamoxifen in patients with idiopathic retroperitoneal fibrosis: an open-label randomised controlled trial. The Lancet. July 2011. Ergun I, et al. (2005). Tamoxifen in the Treatment of Idiopathic Retroperitoneal Fibrosis. Int’l Urol and Nephrol.